Storage is an essential component of any well-designed kitchen. Without enough of the right kinds of storage, you’ll always be struggling to stay organized. This is true for everyone from gourmet chefs to those who simply use their kitchens for basic tasks like boiling pasta and reheating leftovers. When it’s time to update your kitchen, one of the first things a kitchen remodeling contractor will ask when designing the cabinets is whether you prefer drawers or doors. Picking one or the other might not seem important, but the functionality of your kitchen could be at stake. Use this quick guide from DreamMaker Bath & Kitchen of Orland Park to see which side of the drawers versus doors debate you fall on. • Utilize drawers as base cabinets for heavy items like pots and pans. 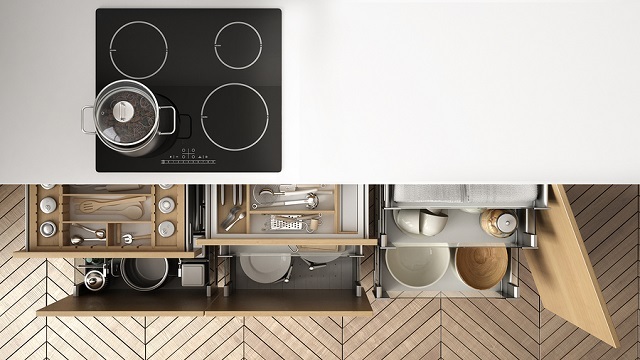 Drawers that pull out all the way make it easier to access stacking items like cookware and serving platters. • Outfit drawers with inserts. Peg systems for plates and mugs, shallow drawers for utensils and servingware, and custom drawers for small appliances like coffee machines are popular. • Stack like items include bowls and oversized plates in drawers. Remove as many as you need at one time without disturbing the whole stack. Drawers are often ideal for lower cabinetry, but doors still have their place in contemporary kitchen remodeling projects. Make doors part of your upper cabinetry sections and use them for storing lightweight items like glasses, stemware and cookbooks. Doors can also conceal pull-out shelves to allow for more convenient storage. Combining drawers and doors in your kitchen may be the best way to make your space a chef’s paradise. Providing easy access to often-used dishes and deep, customizable storage for cookware and heavy items, drawers and doors work together to create a functional, designer kitchen. DreamMaker Bath & Kitchen of Orland Park can guide you through the remodeling process from start to finish to help you realize the kitchen of your dreams. Call (708) 429-6670 or submit our online form to start a conversation!